In anticipation of the Final Draw to be broadcast on Telemundo and Universo this December 1 at 9:30 a.m. ET, Telemundo Deportes unveils its coverage plans for the 2018 FIFA World Cup Russia™ taking place next June 14 - July 15. As the exclusive Spanish-language home of the 2018 FIFA World Cup, Telemundo Deportes will provide extensive multimedia coverage including more than 500 hours of World Cup-related programming across Telemundo Network and its sister cable network Universo, and more than 1,000 hours of original content across Telemundo Deportes' digital platforms. Telemundo and its cable network Universo will broadcast all 64 games live; 56 airing on Telemundo and eight on Universo. In addition, all the matches will stream live via the Telemundo Deportes' En Vivo app and TelemundoDeportes.com. "We have been looking forward to Russia 2018 since 2011 when Telemundo, with the support of NBCUniversal, became the new Spanish-language home of the FIFA World Cup," Ray Warren, president of Telemundo Deportes, said. "As we approach the World Cup Draw this Friday and the World Cup Finals next June, we at Telemundo and NBCUniversal renew our commitment to deliver the highest quality, most consumed, and most talked about FIFA World Cup coverage in the event's history." Telemundo and Universo will provide more than 500 hours of World Cup-related programming throughout the tournament. Coverage includes 250+ live hours of game coverage including pre and post shows on each matchday and more than 170 hours of programming on Universo. In addition, Telemundo's regular daily programming will supplement the coverage with more than 100 hours of content during the month-long event, covering all angles of the tournament. Telemundo Deportes' digital platforms will provide more than 1,000 hours of content including a live stream of all Telemundo Deportes' programming, exclusive short- and long-form content, highlights and more. All 64 matches, in addition to the pre/post programming, will stream live via the Telemundo Deportes En Vivo app and TelemundoDeportes.com available on desktops, tablets, and connected TV's — including Roku, Apple TV and Amazon Fire. Telemundo will be covering all angles of the event with production sites across Russia's most iconic locations. Red Square, Moscow's historic plaza, will be the home of Telemundo Deportes' programming, including the production of all the pre, post and halftime shows while Telemundo's daytime programming will also originate from Moscow. In addition, Telemundo will have support studios at the World Cup International Broadcast Center and unique integrations from Telemundo Center, NBCUniversal Telemundo Enterprises' new, state-of-the-art headquarters Miami, FL. Telemundo Deportes' award-winning team of on-air talent will be led by the internationally renowned commentator Andres Cantor. A 4-time Emmy Award winner, recipient of the Sportscaster of the Year award from the American Sports Broadcasters Association, a Hispanic Heritage Award recipient, and author of "GOOOAL! A Celebration of Soccer." This will be Cantor's 10th World Cup and his 8th as a play-by-play announcer. Cantor will be accompanied by a stellar group of talent, including National Emmy Award-nominee, Sammy Sadovnik, Miguel Gurwitz, Ana Jurka, Carlos Hermosillo, Karim Mendiburu, Copan Alvarez, Manuel Sol, among others. The team will also be joined by a group of diverse soccer personalities with an unmatched depth and breadth of expertise around all angles of the game, representing the most relevant countries participating in the World Cup. Carlos Hermosillo: Hermosillo is a Mexican soccer legend who has gone on to a successful career in television sports. He is part of the Telemundo Deportes' on-air team and one of the top all-time goal scorers for the Mexican National Team and Cruz Azul. 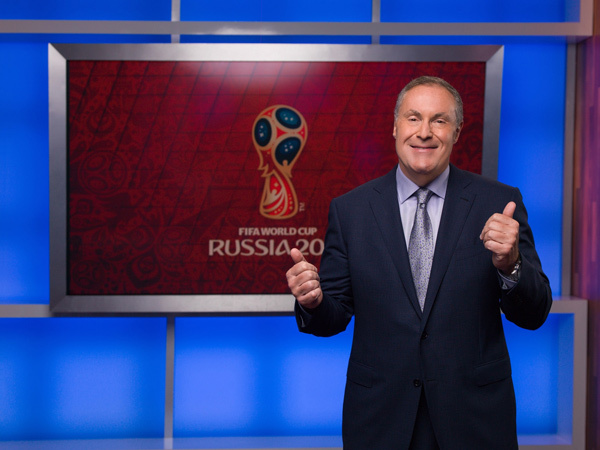 Claudio Borghi: After a stellar performance as guest analyst for Telemundo's coverage of the FIFA Confederations Cup, the Chilean-Argentine manager and former soccer attacking midfielder returns to join the team for Russia 2018. Borghi is a World Cup champion having played alongside Maradona when the Argentina team won the 1986 FIFA World Cup. He also played for several clubs in Argentina and Chile and spent time in Italy with A.C. Milan. After retiring, Borghi has been coaching club teams in Argentina and Chile and served as head coach for the Chile National Team between 2011 and 2012. Sebastián "El Loco" Abreu: Former Uruguayan striker who represented his country in the 2002 and 2010 FIFA World Cup and several Copa Americas (1997, 2007 and 2011.) He also played in a number of clubs throughout Uruguay, Argentina, Mexico and Brazil. Rolando Fonseca: Costa Rica's national team's all-time top goal scorer who's also widely known among Mexican soccer fans for ending Mexico's 20-year undefeated streak at Azteca stadium in international play back in 2001, after scoring a penalty kick. He also played for Liga MX's Pachuca. Juan Pablo Ángel: Ángel is retired soccer star from Colombia who spent most of his career playing with popular clubs around the world including Premier League's Aston Villa, Atletico Nacional, River Plate and Red Bulls. He was also part of Colombia's National Team during the qualifiers for the 2002 and 2006 FIFA World Cup. During Telemundo and Universo's exclusive broadcast of the Final FIFA World Cup Draw this Friday, December 1 at 9:30 a.m. ET, the network will unveil a new spot as part of the World Cup marketing campaign to be used through the kickoff of the tournament next year. The campaign reflects how soccer viewers live the World Cup together, aiming to create a cultural movement for Telemundo's most unique, exciting, authentic World Cup coverage among all Hispanics across every platform, regardless of language, ever. The campaign will debut with a new promo to air across Telemundo, Universo and several NBCUniversal platforms. In celebration of the Draw, Telemundo will also showcase the creation of an artwork mural, live at the iconic Wynwood Art District in Miami, FL. The mural will be crafted by the renowned Miami artist Lebo who's known for his compelling visual work, and will feature the countries participating in the World Cup. The artwork will be unveiled on December 1, following the Draw results.